Major John Hoare - The Major is technically a part of the Galactic Navy's ATF. Trained under Commander Slaughter during the Druusch Wars, John found himself particularly drawn to Jungle planet fighting. Raised in a similar climate, John loves the heat and the close quarters environment. Opting, usually, for some kind of pistol and combat knife combo plus his own extensive hunting skills. This mini is an homage to both the schlocky sci-fi movies of the past and 80s action movies. He's wearing a vest and combat pants / boots and is armed with totally unsuitable weaponry for alien based jungle combat. But he looks tough as nails doing it! . Because of that he's listed as a Modern miniature as he has pretty much no sci-fi trappings whatsoever! 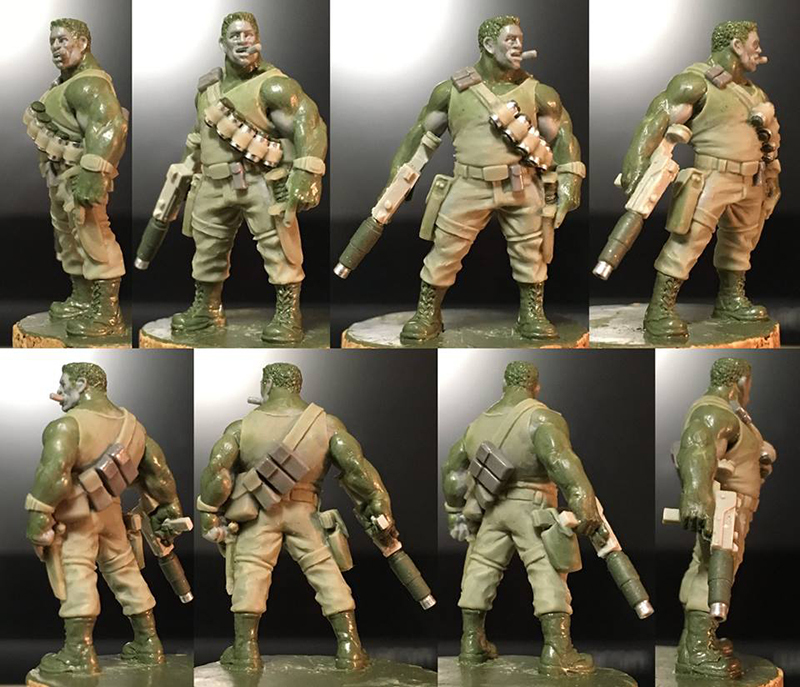 This is a Limited Edition Resin 'Master Casting' of Major Hoare, the standard white metal version (when available) can be found below. These Master Castings are strictly limited to however many we can get out of any Master Moulds before they deteriorate. These are about as limited as anything we've made and are the closest thing to Kev's original green as possible so hold the highest level of detail available.